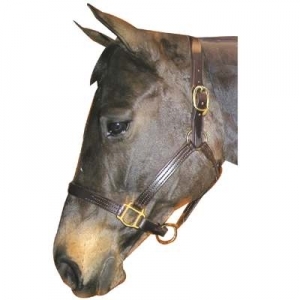 Every Horse Halter here at Horse Tack Now is professionally made and goes through a stringent quality control team that makes sure you only receive the greatest quality halter available. The latigo lined leather horse halter is 1'' and features solid brass hardware with crown buckles on each side. The horse halter has triple stitching and a rolled throat. Horse Tack Now is your ultimate source for track halters on the web.